Although Canon launched its first mirrorless camera, the EOS M, back in 2012, the company has never quite seemed to take the idea seriously. Like its great rival Nikon, Canon apparently preferred to protect its entry-level DSLRs instead, with only six native EF-M lenses for the system appearing to date. 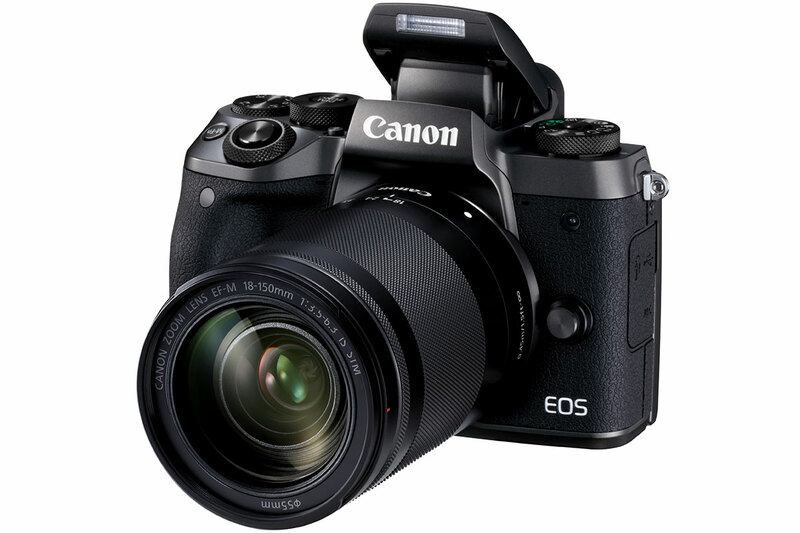 However, with the Canon EOS M5, it has finally made a camera to turn enthusiast photographers’ heads. In essence, the EOS M5 is a DSLR-like model with a centrally mounted electronic viewfinder and tilting rear touchscreen. This is a design blueprint that has proved popular with photographers ever since the appearance of the original Olympus OM-D E-M5. Yet Canon has managed to cover the M5’s petite body with a well-thought-out array of buttons and dials that promise to make it one of the nicest-to-use small CSCs we’ve yet seen. The addition of Dual Pixel CMOS AF and the latest DIGIC 7 processor means that it feels genuinely quick, too. 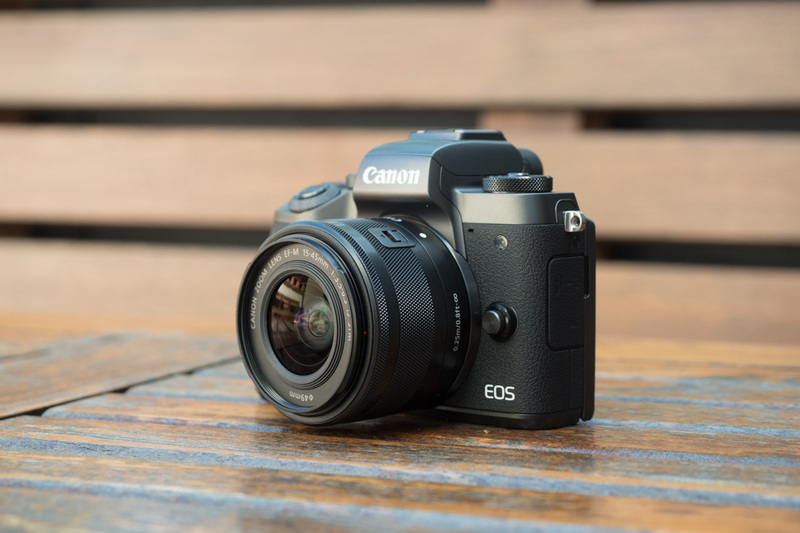 The Canon EOS M5 is scheduled to go on sale at the end of November, with a price of £1,049 body only, or £1149 with the compact EF-M 15-45mm f/3.5-6.3 IS STM zoom. In mid-December a kit with the new EF-M 18-150mm f/3.5-6.3 IS STM lens will be available, for £1,399. In an apparent admission of the paucity of the native EF-M lens range, all these will come with an adapter for Canon’s EF and EF-S DSLR lenses in the box. Canon says the 24.2-million-pixel sensor is new for the EOS M5, and while it’s closely related to that found in the EOS 80D, it has gapless micro lenses for improved sensitivity. Meanwhile, the M5 is just the second model after the PowerShot G7 X Mark II to sport Canon’s new DIGIC 7 processor, which is said to be 14 times more powerful than the previous version. 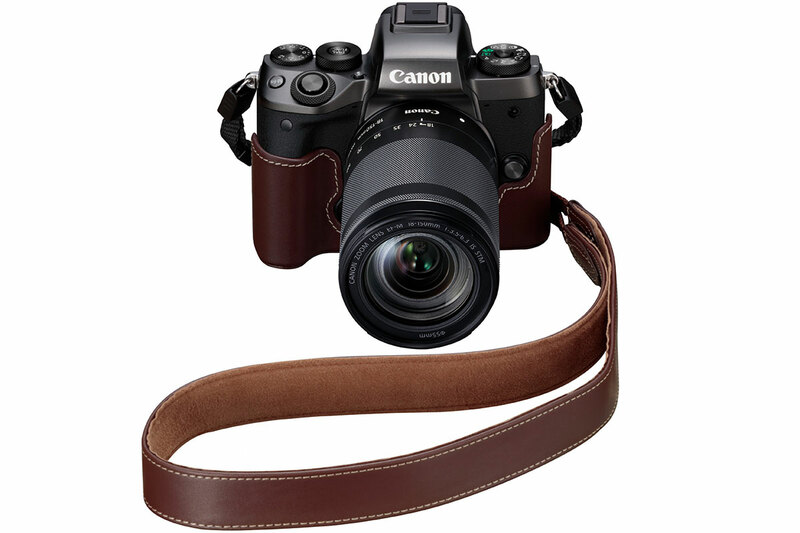 Together the two enable a sensitivity range of ISO 100-25,600 and 14-bit raw output. The EOS M5 can also shoot at seven frames per second with AF between shots, or nine frames per second with focus fixed, with a 26-frame JPEG buffer. The M5 promises 295 shots per charge from its LP-E17 battery, or 420 in its power-saving ECO mode. 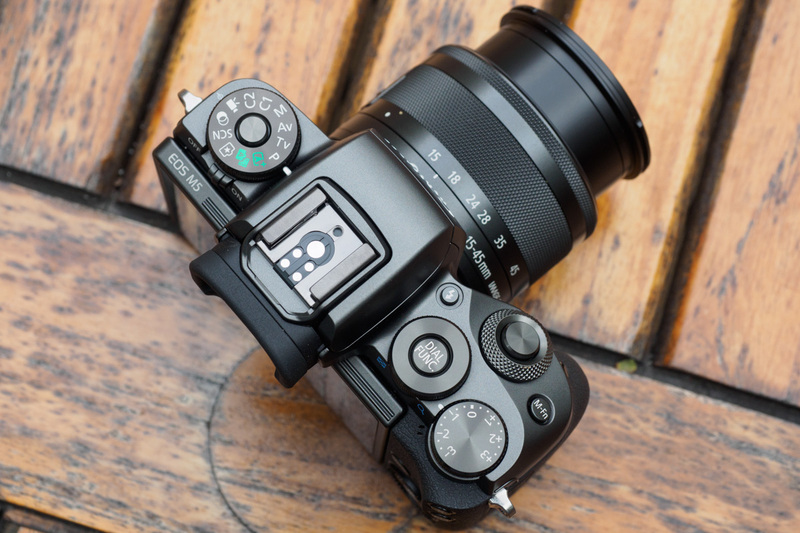 For viewing, there’s a 2.36-million dot OLED EVF similar to that used in the PowerShot G5 X. With a 120fps live view feed and a magnification of around 0.62x, it’s also comparable to those used in cameras like the Fujifilm X-T10 and Olympus OM-D E-M10 Mark II. It’s complemented by a 3.2in 1.62-million-dot LCD that tilts upwards for use a waist-level finder, or downwards for overhead shots. It can even be set to face fully forwards beneath the camera for selfies, rather like the Olympus Pen E-PL7. The screen is touch-sensitive, and thanks to Canon’s excellent interface it complements the physical controls very well. Not only can it be used to change almost any setting, but it’s also available for selecting the autofocus point, even when using the electronic viewfinder. We’ve seen this on plenty of cameras before, but the EOS M5’s implementation cleverly allows you to choose the area of the screen you wish to use. You can either use the whole screen, left or right halves, or any of the four quarters. A 3.5mm microphone socket is included alongside USB and an E3-type remote-release socket. Video recording is available in full HD resolution at up to 60fps, with a built-in 3.5mm stereo socket for adding an external microphone (but no headphone socket). Somewhat surprisingly there’s no 4K video option, which we’ve started to see almost as standard recently from companies such as Sony and Panasonic. However you do at least get full manual control over exposure in video mode. There’s 5-axis image stabilisation on board, but it’s electronic so unlikely to be as effective as the mechanical systems found in rival cameras from Olympus and Panasonic. However, it means footage will be stabilised even when using non-IS lenses, and the electronic stabilisation can be combined with optical stabilisation when using compatible EF-M or EF-S lenses. It’s also possible to pull focus from one subject to another during recording simply by tapping the touchscreen. 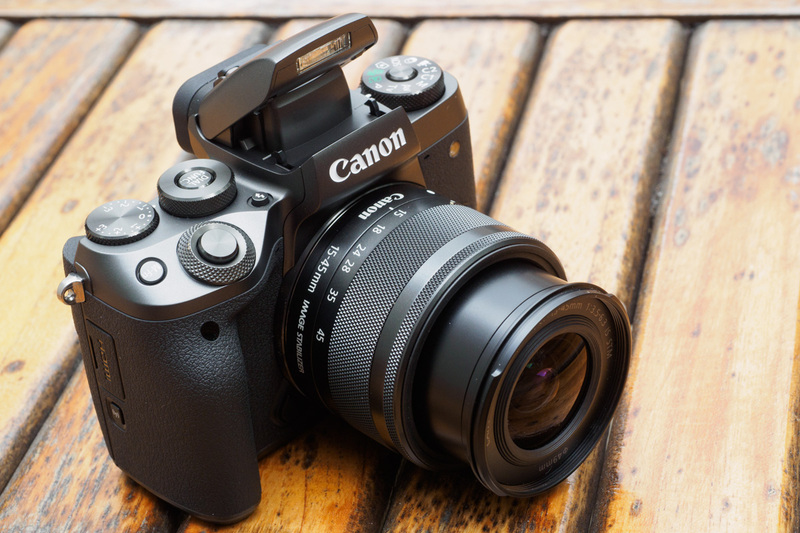 The Canon EOS M5’s body is primarily polycarbonate rather than aluminium or magnesium alloy, but it still manages to feel sturdy in your hand, aided by a nicely sculpted rubber-coated grip. 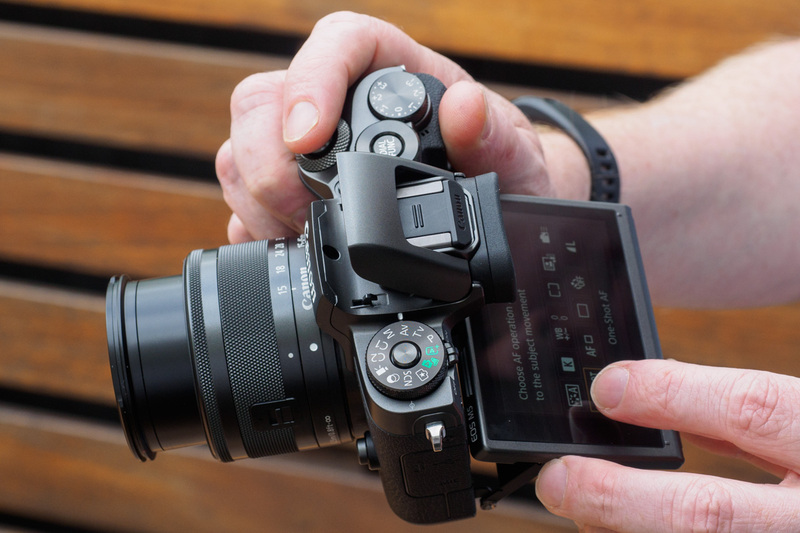 Indeed, it handles remarkably well for a small camera that measures just 115.6×89.2×60.6mm and weighs 427g. The impression of quality is maintained by the attractive gun-metal top-plate and beautifully knurled metal dials. Canon says these have been designed to be easy to use, but difficult to knock accidentally, and judging by my time with the camera it appears to have achieved these aims. In fact, the design and control layout are an evolution of the EOS M3’s, which I found to be a very pleasant camera to use. 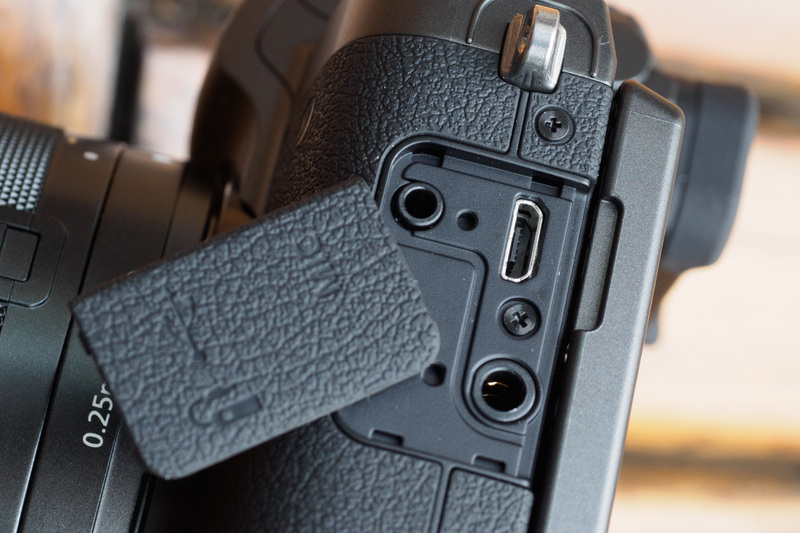 But alongside an exposure compensation dial and electronic dial around the shutter release, Canon has added an additional thumb dial on the top-plate. Pressing the Dial Func button in its centre cycles through various functions depending on the exposure mode, including ISO, white balance and drive mode. At first sight, this looks like it should be a really nice way of putting lots of control at your fingertips. Add in the comprehensive on-screen control panel and even touchscreen sceptics should rarely have to dip into the menus. 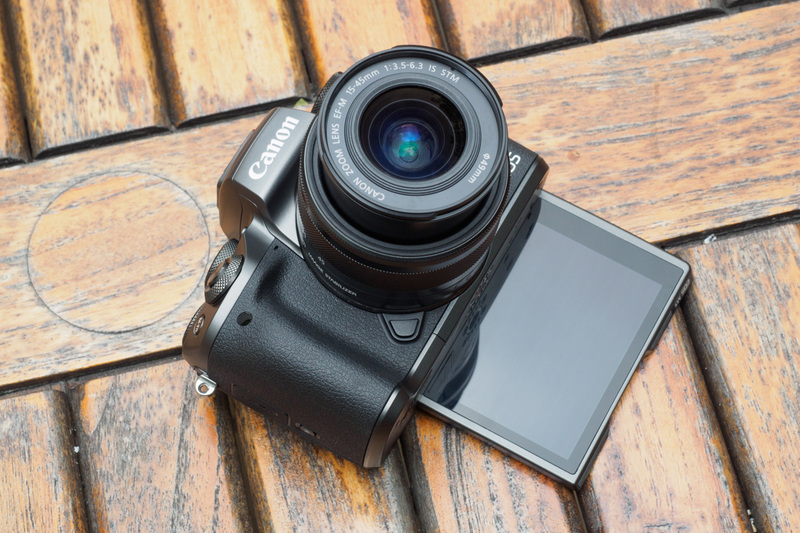 For the first time on a Canon camera, the EOS M5 adds low-energy Bluetooth 4.1 connectivity alongside Wi-Fi and Dynamic NFC. 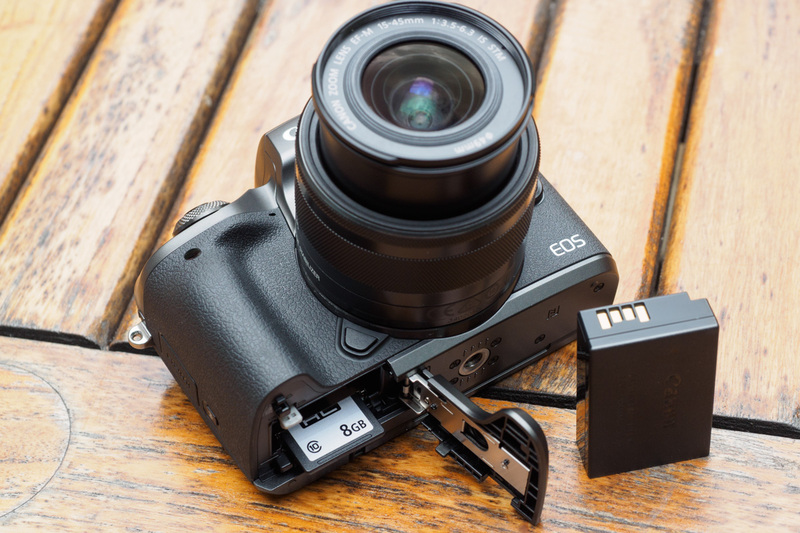 The idea is that this can maintain a permanent connection to a smartphone, allowing it to be used as a remote shutter release without a huge impact on battery life. It can also be used to turn on Wi-Fi for copying images across for sharing, or controlling the camera remotely with a live view feed. This means it’s a little different to Nikon’s latest SnapBridge technology, which uses Bluetooth to automatically transfer every image you take to your phone. Traditionalists will be pleased to find that the EOS M5 can also use both wired and infrared remote releases. Alongside the EOS M5, Canon has revealed the EF-M 18-150mm f/3.5-6.3 IS STM lens. With an 8.3x range equivalent to 29-240mm on full frame, the lens includes optical image stabilisation. With a claimed 4-stop benefit for low-light handheld shooting, this includes full compatibility with the EOS M5’s 5-axis electronic IS. A stepper motor promises fast, silent autofocus, and there’s a seven-bladed circular aperture designed to give smooth out-of-focus blur. Weighing just 300g, the lens is due in mid-December for £429. Canon has also shown some further accessories for the EOS M5, although details are scarce. The EH29-CJ body jacket is a half-case in either black or brown leather, and there’s a matching EM-300DB premium neckstrap too. 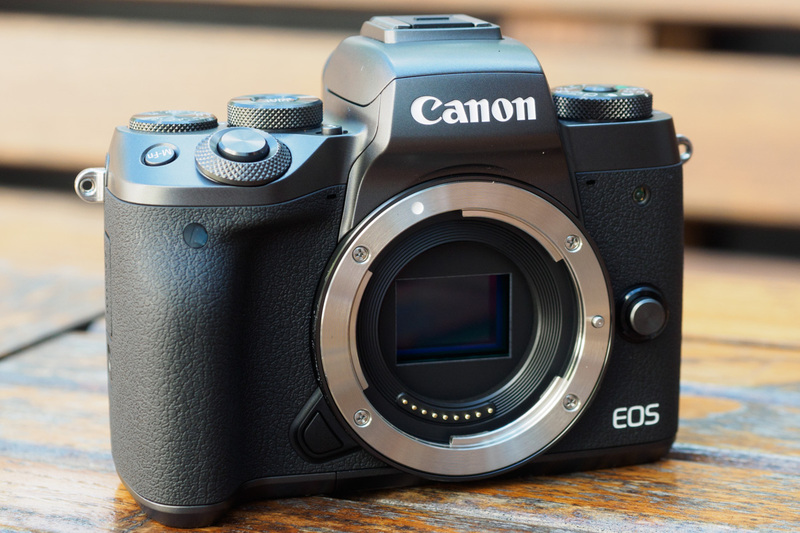 With the EOS M5, it seems Canon has finally made the mirrorless model that everyone has been asking for: DSLR-styled with a central viewfinder and lots of external control for enthusiast shooters, plus Dual Pixel autofocus. It certainly has a lot of potential for persuading Canon’s dyed-in-the-wool DSLR users to try out mirrorless technology for the first time, especially with the EF lens adapter included to ease the transition. However, AF performance is still likely to be patchy with adapted EF lenses, especially those with older focus motors. 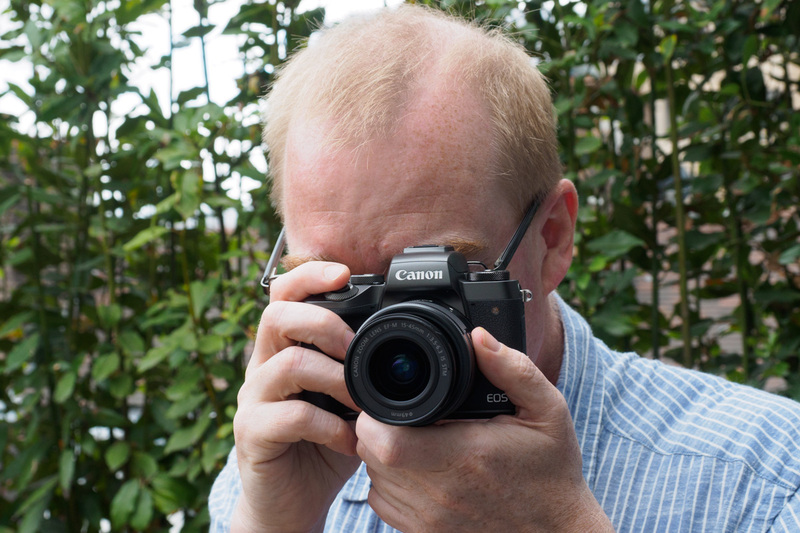 The stumbling block, however, could be the price: the £1,049 Canon EOS M5 looks broadly comparable in terms of specification to the Fujifilm X-T10, which currently costs around £450 body only. 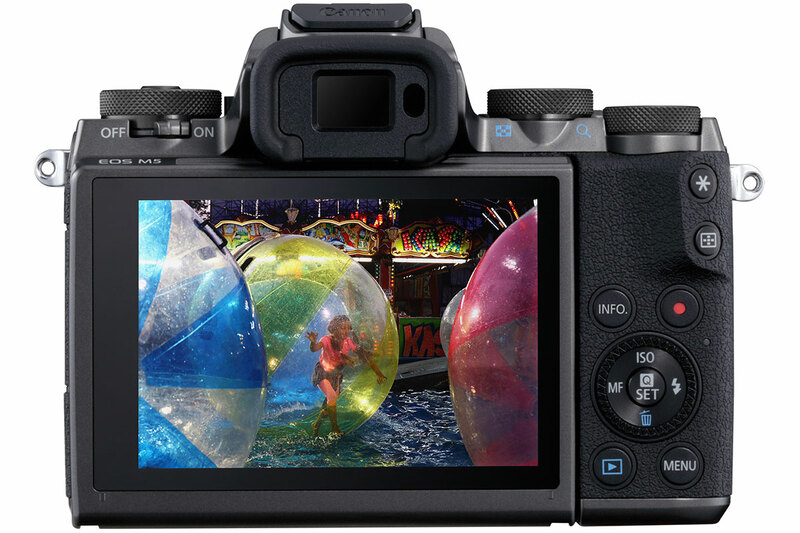 Alternatively, for around the same price as the EOS M5, you could buy a Sony Alpha 6300, which includes 4K video recording, weatherproof build and hugely capable autofocus. 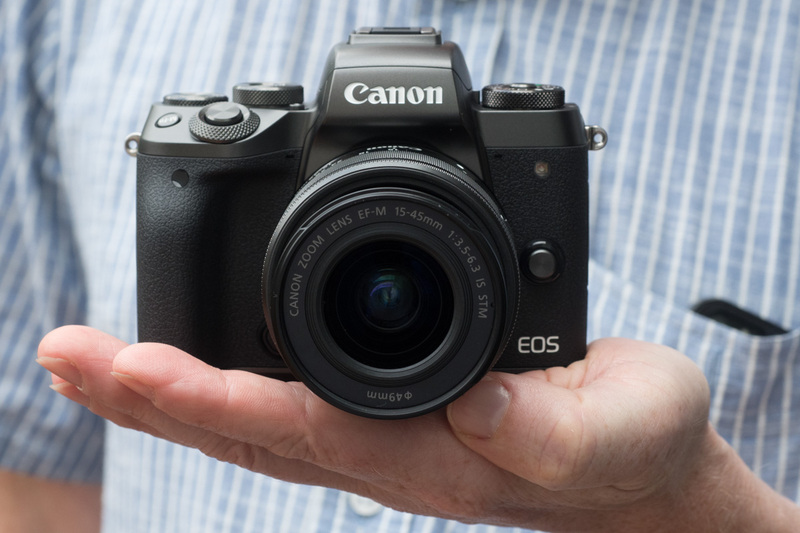 Even so, we’re excited to see Canon finally making a mirrorless model that enthusiast photographers could get excited about, and we’re certainly looking forward to getting hold of one for a full review.